Opportunities to make a genuine difference worldwide await you as a family! 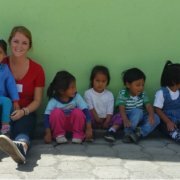 Global Volunteers is your safest, most affordable option abroad. To encourage service together, we offer family volunteer abroad discounts. Refer to all international program discounts here. Further, as a 501-C3 tax-exempt organization, all program-related costs – including airfare – is tax-deductible for U.S. taxpayers. This is the most affordable way for families to travel and volunteer together! See program locations worldwide here. Volunteering as a family abroad can be a once-in-a-lifetime experience. Discounts on service program fees are available for two or more family members traveling together. Students also receive discounted service program fees. Children 12 and under receive special family volunteer abroad discounts. One child (ages 6-12), traveling with one adult, pays 60% of the standard international program fee for all family volunteering programs except Poland summer camps. This discount cannot be combined with any other discounts. Each service program has minimum age requirements, so please refer to this guide for eligibility depending upon your child(ren’s) ages. Our volunteer programs are led by staff and alumni who are trained in volunteer engagement, health and safety, host relations, and most important – delivering essential services to help children and families reach their full potential. The age-appropriate work assignments you and your family members accept are designed to maximize your capabilities. Call a volunteer coordinator at 800-487-1074 for additional information about family volunteer abroad discounts, or chat online now!